Don't buy a new tub or sink! 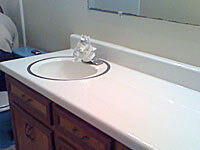 Resurfacing is an excellent way to update your kitchen and baths. Compared to replacement, resurfacing is very cost effective, and can be applied without the long downtime of remodeling. Resurfacing is a very cost-effective alternative to replacing and remodeling worn-out tiles, sinks, tubs, and countertops. The glaze on tubs and tiles wears out over time, leaving the pores of the underlying porcelain exposed to dirt and water impurities. Scrubbing will only make the situation worse. Resurfacing can be done at a faction of the cost of replacement. The length of work depends on the size of the job. 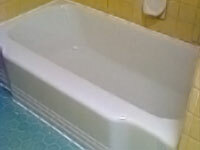 But a tub can be resurfaced in just 3-4 hours and ready for use again in a minimal amount of time. All work is performed in your home by trained technicians who will leave the work area clean and neat. With normal use and care, the new surface will last for many years. 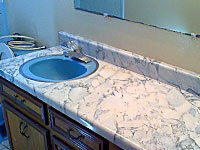 Resurfacing colors can be matched to any plumbing fixtures. We can even custom blend special decorator colors to match your décor. Or, if you’re ready for a change, we can provide advice on re-coloring. We can even go from a dark color to a light one. The choice is yours completely. 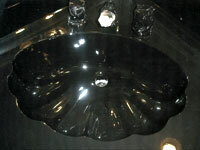 Resurfacing adds years to the life of your fixtures. Rather than replacing them just because they’re worn out or their color is outdated, you can make them look new again. In less than a day you can have the kitchen or bathroom of your dreams, without the nightmare of expense of remodeling. The process is simple. 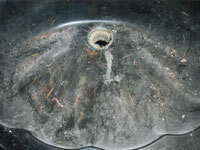 First, the old, worn, unsightly surface is chemically treated and cleaned. Any chips scratches or other damaged areas are filled and sanded smooth. Then several layers of our exclusive materials are applied, creating a strong durable, lustrous finish that is fully guaranteed. Our surface can be regularly cleaned and sanitized with a good liquid cleaner of your choice, yet will remain stain resistant, safe and beautiful. All of our products are thoroughly tested and meet the high standards needed to perform as expected on your fixture for many years. We use only the best materials available in the industry and back them up with expert service, installation and a guarantee for your personal reassurance. Our materials are lead free and with our means of exhausting during application, odor is kept to a minimum. Contact us today for a free estimate. A new kitchen or bath will be simpler and less expensive than you ever though possible. 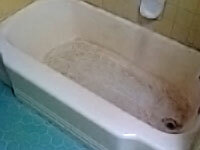 "Profinish saved my tub. Their service was great and I don’t know what I would have done without them." My house is 10 years old, and my kitchen counters just aren't pretty anymore. Is there an alternative to a costly and messy renovation? Be sure to visit Slipguard Works for permanent anti-slip coatings on any wet surface.